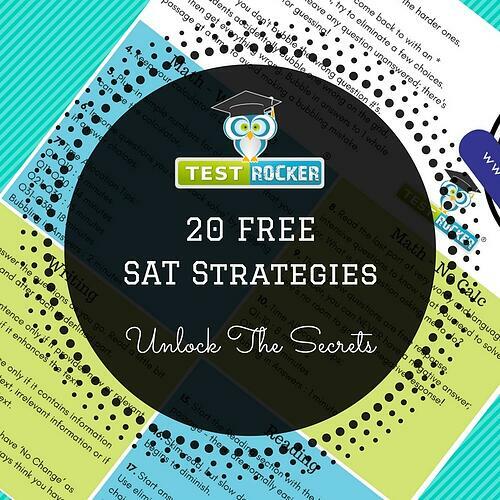 This free SAT strategies guide reveals the best ways to rock the test. Math Calculator, Math No-Calculator, Reading, Writing Sections, and General test strategies. This free SAT strategies guide has information regarding all sections of the test, as well as general test taking tips. These strategies are keys to unlocking your best scores. When it comes time to pull out the calculator, you'll need to know what to do in order to move through the test quickly and confidently. These are must-know tips for the SAT test. When you are no longer allowed to use your calculator, things can get a little stressful. Don't worry, these tips will help you through it. How do you read the question? Follow our question breakdown method and you'll learn to read a question most effectively. How many minutes should you spend on each question set in this section? For many students, the reading section is the most daunting section because there is a lot of content to get through in a short amount of time. These reading tips will help you do well on the SAT reading section. Dos and Don'ts for taking the SAT. Scroll up and fill out the form to access the 20 SAT Strategies guide.